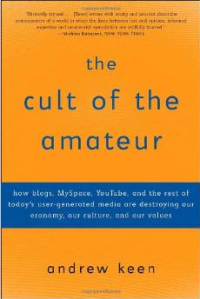 Or “The Cult of the Amateur: How blogs, MySpace, YouTube, and the rest of today’s user-generated media are destroying our economy, our culture, and our values ” to give it its full title, by Andrew Keen. As you might expect from the title Andrew Keen is against user-generated content and social media. For him truth should be in the hands of the experts, and reporting is in the hands of journalists. He sees the demise of traditional media, particularly print media and laments its passing. It’s an anti Web 2.0 rant. He makes a valid point regarding the credibility of bloggers vs news journalists, but ignores that journalists have also been guilty of faking stories and other, unethical behaviour. But beyond that the view is so biased and so limited that it becomes annoying rather than enlightening. There are a number of pencil notations in my copy, next to contradictions in his argument. For example one big complaint is the lack of accountability on the web, yet Reed College also comes under fire for denying admission to a student who had published rude comments about the school. I agree that there are issues to be solved that most Web 2.0 evangelists ignore, such as the issues of privacy vs anonymity, censorship (necessary to protect children) and intellectual property. But I am more optimistic than Mr. Keen.